“It would be fun to have specific directions as to how to build a potted bulb garden. I think it has to sit in the refrigerator (40 degree area) for 12 weeks. Also you could write about the proper time to cut down perennials. I’ve heard the new thinking is let them stand until spring (to feed our winter friends) and then chop them down inch by inch to create mulch. Thank you for the email regarding your bulbs and perennials. Bulbs made to flower at other than normal times are said to be forced. The practice of forcing is commonly used to flower daffodils, hyacinths, tulips, crocus and other spring bulbs during the winter. With proper planning and care, bulbs can supply color for the home from late November until early April, when they begin to flower normally outdoors. cold-temperature treatment, bringing bulbs into a cool room, and placing the plants in a display location when well-developed. Many varieties of daffodils can be forced. Paperwhite Narcissus are suitable for earliest forcing either in pots or in water. –Pots 4 to 8 inches in diameter. Short pots known as azalea or bulb pots are preferred. –A well-drained potting medium such as a blend of Sphagnum peat, vermiculite and perlite. High fertility is not essential, but good drainage is important. No fertilizer is needed at potting time. –Wood, plastic or metal labels. –Hyacinths and tulips: Allow only the tip of the bulb to show above the soil line. –Daffodils: Plant so about one-half of the bulb shows above the soil line. –Small bulbs (crocus, snowdrop, grape hyacinth, etc. ): Plant so they will be about one inch below the soil line. *Set the bulbs in the pot. One large bulb may be placed in each 4-inch pot. Use six tulips, three hyacinths, five daffodils or 15 crocus (or other small bulb) in each 6-inch pot. 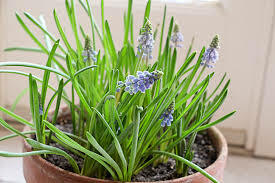 All bulbs in a pot should be of the same kind and variety to ensure uniform flowering. Place tulips with the flattened side of the bulb toward the outside of the pot. *Fill around the bulbs with potting medium to the proper height. Firm the medium with light pressure, but avoid tight packing. After planting, the final potting medium line should be about 1/4 to 1/2 inch below the rim of the pot. *Label each pot with variety of bulb, date of potting and expected date to begin forcing. *Add water until it drips through the drainage hole in the bottom of the pot. After about one hour, dump out any water remaining in the saucer. A cold frame is easily built outdoors and may later be used for other gardening activities. Place the pots to be forced in the cold frame and cover them with sawdust, straw, leaves, peat moss, shredded styrofoam or other material. The cold frame should be in a shady place or on the north side of a building so the soil is as uniformly cool as possible in October and November. No sash is needed on the cold frame. Bulbs that have been forced indoors are usually of little value for outdoor planting afterwards and should be discarded. As for your perennials, you can chop them down if they herbaceous (not recommended for roses or other woody perennials that come back on the same stems/foliage). However, the only thing to keep in mind is to wait until the foliage had died back. If the stems or leaves are still green, the foliage is still feeding the plant and preparing it for winter. “Hello, I have ordered bulbs in the past from you and have been generally pleased with your products. I do have a question about bulbs–especially daffodils–that bloom for one or two years then no longer come into flower. I am trying to grow them according to instructions by letting the foliage die back naturally and not let them get too crowded and use fetilizer when planting, but some bulbs just produce leaves after awhile. My question is, will they eventually bloom again? Or is it a waste of time and garden space to keep them? Would it be better just to dig them up and start over? I haven’t seen the answer to this on the garden blogs, etc. on the internet. Thank you for your reply, ~M. Thanks for the question regarding your bulbs that aren’t blooming anymore. The overall cause of a bulb not producing a bloom is either the bud wasn’t formed or it was damaged in some way. There wasn’t enough sunlight last summer or you planted your bulbs in too shady an area. For the most part, spring blooming bulbs want full sunshine for at least six hours a day. If you do not give them enough sunshine, they may live but not have enough energy to produce a flower bud. You might have planted them too early last fall. Once the bulb had rooted and the ground was still warm, it might have started to produce a flower bud. Once that bud emerges, it either lives or dies on the soil temperature. An emerged bud that hits frozen or too-cold soil is going to die and this means there won’t be another bud for the following spring. Perhaps you overfed or overwatered those bulbs. Overwatering bulbs will most often kill them because they will rot (think of leaving an onion in a glass of water). Spring flowering bulbs have developed in areas where there is winter-cold and spring-rains but summer drought. When you water your garden in the summer to keep the annuals and perennials happy, you are making your bulbs unhappy. Too much water and the bulbs will disappear taking their flowers with them. Perhaps the bulbs have grown up magnificently and multiplied. If so, they might simply require dividing to produce flowers again. This is not likely in a normal garden setting but possible. You can tell if there are scads of leaves all coming from the same small area if the bulbs are too crowded.